Google AdWords and Facebook PPC with a GOOD LANDING PAGE and REMARKETING is the FASTEST Way to Generate New Quality Leads (that turn into customers) for Local Businesses. If Your Pay Per Click Advertising Company is Not Producing a Great ROI, Discover What We Can Do to Save You Money and Generate Revenue Fast! If your pay per click advertising company is not producing a great return on your investment, here’s what you need to know. PPC can work really well to generate leads and customers fast and at a very good ROI. There are 3 main reasons why local businesses experience a poor ROI and advertising failure. Google AdWords and Facebook limit the amount of characters that can be included in each line of the ad. This makes it particularly important to include clear and concise benefits as well as pertinent information. The ads must also include appropriate keywords that hook the visitor and prompt an action (to click the ad). Many local business advertisers make the mistake of sending their Google AdWords and Facebook ad traffic to a website where the visitor becomes confused and rapidly leaves the site. An effective landing page is one that takes the visitor to a mobile friendly page focused on their search with a single call to action or conversion goal. Magnify your ad results and substantially lower your advertising costs by having your ad follow prospects who clicked on your Facebook ad or Google AdWords ad and visited your landing page. That is precisely what Remarketing does. Remarketing is a low cost ad strategy where code added to landing pages follows the visitor who clicked on an ad or a web page. Through remarketing code that is added to the page, the ad shows up for the visitor wherever they go. An attorney’s prospects think that the attorney’s ads are EVERYWHERE and they are! They appear wherever the prospect is browsing! This strategy can be achieved through Google AdWords, Facebook and another platform that we also may include. Remarketing is an inexpensive strategy that gives you multiple chances to reach people who showed an interest in your service. What types of businesses does PPC work best for? When competition and cost per click is high, PPC and remarketing work best for local businesses where the value of a customer is high. This would include legal and financial services, spas, plastic surgeons, chiropractors, home improvement contractors, and certain types of retail. Branded merchandise and collectibles in demand, and unique art creations can produce a substantial ROI. Of course, good results depend upon good quality ads, ad campaigns and high converting landing pages. What will determine my results? PPC and remarketing are designed to produce traffic quickly. The quality of the ads will determine whether the ad is targeting the right market and is likely to attract buyers vs. window shoppers or someone looking for something else. Both Google and Facebook provide you with extensive demographics for targeting your ads to the right market. It is important that these settings are carefully configured. Successful conversions occur when a prospective buyer clicks the ad and lands on a properly designed mobile friendly landing page. The page should be simple and clean with a professional design and without distracting navigation or actions that can be confusing. When the visitor finds what they are looking for with compelling information and a single and clear call to action, there is a good chance they will convert from a lead into a customer. Is PPC better than organic SEO? PPC and remarketing are designed to produce traffic quickly. This depends upon properly managed campaigns with good ads and high converting landing pages. Google search results are designed to show the sponsored ads on top and in the right margin. Some searchers prefer to click on ads while others will look in high authority directory sites that are generally listed above other organic results. Other people will take their time and explore content in the organic search results. Having a presence in all of these places is a very good strategy for long term and sustained growth. It is important to understand that visitors searching through directories will search by category within that directory. Organic rankings take time. Achieving top rankings on the first page is very difficult for highly competitive keywords. If you’re main goal is to drive business to you quickly, PPC is the best form of advertising for producing quality buyers at the lowest cost. What will most PPC ad companies do? Most pay per click advertising companies will promise you traffic from their efforts. But in reality, clicks to your site do not necessarily produce a customer or a return on your investment. Ads that aren’t based on the right keywords will attract the wrong market – people who may click your ad but promptly leave the site when they discover that the content isn’t what they’re looking for. An ongoing commitment to split testing ads and landing pages is essential for measuring and improving results. Most PPC companies are not strategists or web developers. They will send traffic from an ad to an existing page on your site. Sometimes that is your home page where the visitor has to hunt around to try to find content that matches the ad. Many times too, the landing page is not mobile friendly even though most searches and purchasing is done from a mobile device. Finally, most PPC advertisers are not responsible for landing page development. 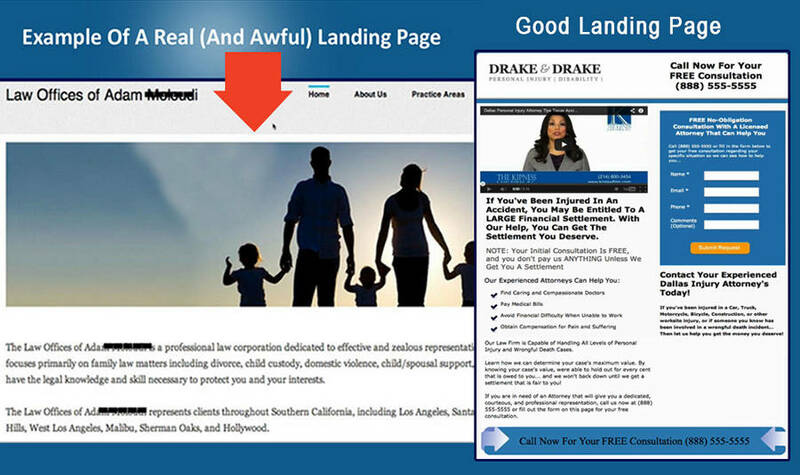 Quality high converting mobile friendly landing pages are critical for a successful campaign. All of these factors alone or together will greatly limit conversions from clicks to customers. How can I reduce my PPC costs? Google wants your ads to produce clicks so that you will continue as their advertiser. Google rewards you for a higher click through rate with lower costs per click. Because your cost per click in Google is related to the keywords within your campaign, you can often find less costly keywords that are just as effective in attracting the right market with your ads. Keyword selection is of prime importance for getting you results at the lowest cost. Other less costly PPC advertising strategies include YouTube video ads and Facebook. Facebook allows you to choose a strategy based on your goals. Sometimes that is to get likes for your Facebook page. You may also choose to promote a post in Facebook or send visitors to a store page, opt in list page or other landing page. How is PPC different from other types of advertising? Most forms of advertising interrupt the recipient with a message that may peak their interest and get them to take action. Types of Interruption ads include radio, TV, magazines, newspapers, billboards, banner ads and mailers. Although some of these can be productive and profitable, the costs are high and return on investment is generally low. The recipient is more of an impulse buyer as they are not actively searching but may act because of a more casual interest in the product or service. Advertising costs are not related to results. PPC advertising produces a high quality buyer’s lead as it represents someone who is actively searching for a product or service. The advertiser only pays when someone clicks on the ad. If the campaign is structured properly, the click lands the visitor on a page where they are more likely to convert from a lead into a customer. WebPuzzleMaster is a full service web design, development, branding and marketing agency. We are certified in Google AdWords and have extensive training and experience in YouTube and Facebook advertising. From organic SEO to pay per click advertising services, we rely on advanced tools and an extensive knowledge of keyword research and demographic targeting. This greatly improves SERP results and the performance of ads at the lowest cost and the highest ROI. Because we are strategists and proficient content and web developers, we create high converting mobile friendly landing pages for PPC campaigns. If you are looking for quality traffic from Google or Facebook fast that converts leads into customers and maximizes your ROI, contact us for a free consultation and proposal.